Before you start any kind of work on your loft you will have to make some kind of access point. You will not only have to make an access point to bring all your equipment into the loft, but eventually you will also need to make a bigger opening to put your new loft staircase into. 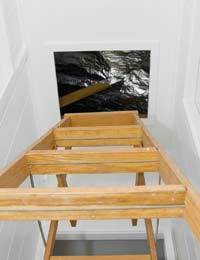 Making an access slot in the loft should be relatively straightforward, but you will need to make sure you support the loft while you fit the hole. The best way to increase the access to your loft is to increase the current opening. If your house is a bit older then you will have separate joists in the loft, more modern houses may have preformed trusses that are more attached to the house, you may need to consult a structural engineer before you start work as you will not want to harm the structure of the loft as it may cause problems with the structural support. The beams in the loft will often be attached to the loft by what is known as stringers, which are longs strip[s of timber, these will help to hold the beams up but will not be designed to hold much weight. As part of your loft extension it is a good idea to get your qualified builder to build the loft hatch for the loft access, if you want to create a temporary loft access though you should be able to do it yourself. Your current loft hatch will most likely be fit into the centre of two beams; you should decide how big you want your new access point and then support the proposed structure with some extra stringers. You should outline your proposed new loft access point with strips of timber and screw them into the current structure. Once you have made the structure firm and you have the timber around the width and length of the hole then you should be able to start cutting the plaster away. Once this is done you will need to screw in place the stringers, and then you should be able to take the timber away and the new access point will be supported. When cutting your loft access hole you might want to use what is known as a roundabout jig. This will allow you to accurately cut a hole into the boarding fairly easily. The jig works by allowing you to cut exactly around a plate of wood and will not disturb the rest of the boarding in the loft, so it should make the job a lot neater. If you are making quite a large hole though this might not be the best option as it will not offer much support for the rest of the flooring in the loft. If you fancy your hand at a bit of DIY then you should be able to easily cut your own access point, if you need something more professional though or something that you are going to use on a permanent basis for your loft staircase then you should contact a professional builder and get their advice.